Ragga-Punk legends Skindred descended on Cardiff’s Tramshed this Saturday, almost slap bang in the centre of their That’s My Jam tour. With almost two months of back to back intimate gigs to promote their seventh album ‘Big Tings’, seemingly using a pitstop in Wales to recharge. Between the confetti-cannon wielding support, whose frontman claimed to be the ‘gayest man in the room’ and Those Damn Crows, with their rippling muscles clad in a mixture of leather and black vests , the two opening acts were truly a contrast in image. While the former did play well, they ultimately joined a very long list of overly ambitious opening acts, thanks to their theatrics, like the somewhat underwhelming crowd surfing, and their attempts to compel an unwilling crowd to sing the choruses. TDC on the other hand delivered a very solid, if rather inoffensive performance, bolstered by the support they received for their Welsh nationality. 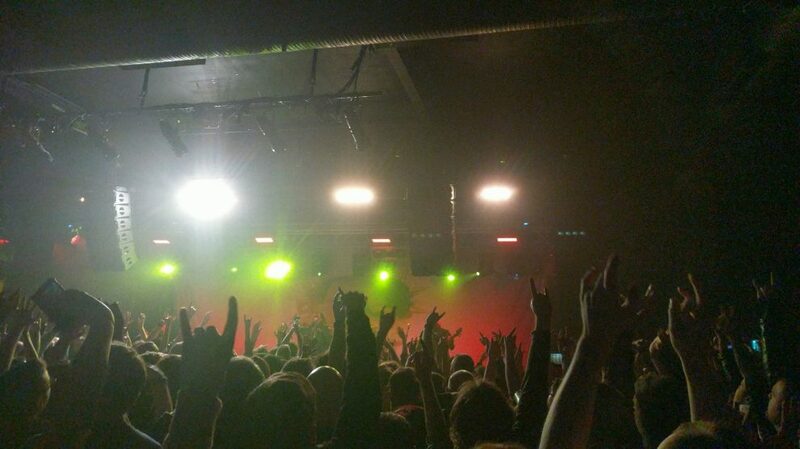 In true Skindred fashion, the band climbed onto the stage to a cheesy remix of the Imperial March, foreshadowing the dark but tongue in cheek show that was about to follow. After dispensing with a quick greeting, the Newport legends jumped straight into their classic banger ‘Ratrace’, and any reluctance from the crowd quickly dissipated, with a couple of cheeky mosh pits opening up. The high energy was sustained with the band playing ‘Pressure’, and began slowly introducing some adlibs to a receptive crowd, who echoed lead singer Benji Webb’s every word, and was capitalised on with a tacky sing-a-long cover of 2pac’s ‘California Love’. For almost every song there was a different pair of infamous sunglasses, and a plethora of scarves and jackets completed the image. A rare break from the humour came with a touching tribute to a friend who had recently been lost to cancer, and was strikingly emotional, more so than the generic ‘peace and love’ segment most band’s pad out their set with. As the set drew to a close with ‘Nobody’, and the accompanying vicious circle pit, it became apparent that Skindred have managed to become one of Wales’s largest musical exports entirely on their own terms, making the music that they want to make. A second realization struck me; for a band with the power to sell out huge venues, like Reading Festival main stage where I saw them for the first time this year, they play a much more candid and natural show in a smaller venue. Sure, the soundstage was a little muddy, the vocals a little subdued, and yes, there was a distinct lack of Newport Helicopters, but you’d be stuck trying to find a band that can have as much fun playing twenty years into their career. Benji’s grand declaration that he “wasn’t playing a show, but a celebration of planet Earth” cannot be confirmed nor denied but it was however, undoubtedly a celebration of the Welsh.